HERTFORDSHIRE, England and PITTSBURGH, Oct. 29, 2015 /PRNewswire/ -- Mylan Specialty, a division of Mylan N.V. (Nasdaq: MYL) which markets and distributes EpiPen® (epinephrine injection) Auto-Injector, today commented on the voluntary nationwide recall of Sanofi's Auvi-Q® (epinephrine injection, USP) auto-injector. Mylan confirms that EpiPen® and EpiPen Jr® (epinephrine injection) Auto-Injectors are not affected by the Auvi-Q® recall, and the company has sufficient supply of EpiPen® Auto-Injector to meet any anticipated demand. Yesterday, Sanofi announced the recall of all Auvi-Q® auto-injectors currently on the market, including the 0.15 mg and 0.3 mg strengths for hospitals, retailers and consumers. According to Sanofi, Auvi-Q® products have been found to potentially have inaccurate dosage delivery. If a patient experiencing a serious allergic reaction did not receive the intended dose, there could be significant health consequences. Given the life-threatening nature of anaphylaxis, those affected by the recall are encouraged to contact their healthcare provider as soon as possible to obtain a prescription for EpiPen® Auto-Injector. According to Sanofi, any out of pocket costs incurred for a new epinephrine auto-injector will be reimbursed. Additional information related to the Auvi-Q® recall can be found on Auvi-Q.com or by calling 1-866-726-6340 or emailing cs@sanofi.com. "We are confident that the widespread familiarity with EpiPen® Auto-Injector established over more than 25 years, coupled with our robust training resources, will provide access and support for those impacted by the Auvi-Q® recall. Anaphylaxis is unpredictable, and should an emergency occur, patient preparedness and immediate access to reliable treatment is critical. Mylan continues to be committed to help ensure access to epinephrine, the first-line treatment for anaphylaxis, and is working to provide a seamless transition for patients and their caregivers who may now be prescribed EpiPen® Auto-Injector," said Mylan CEO, Heather Bresch. Training and support have been a primary focus since the launch of EpiPen® Auto-Injector. Epinephrine auto-injector devices look and function differently, so it is important that patients receive training on proper administration of a prescribed epinephrine auto-injector in a physician's office and practice between doctor office visits. EpiPen® Auto-Injector features include a flip-top carry case designed for single-handed opening and a never-see-needle design that offers needle protection before and after use. Each EpiPen 2-Pak® and EpiPen Jr 2-Pak® includes a needle-free, medication-free Trainer to practice administration technique. A "How To" video that is available on epipen.com, our YouTube Channel and through the MyEpiPlan® App. The Anaphylaxis: Know It. See It. Treat It. Training Video for school staff which is available on DVD or for download at EpiPen4Schools.com. EpiPen® Trainers may be ordered on epipen.com. Additionally, Mylan offers several patient programs and resources including the "$0 Co-Pay Offer" for eligible patients* and a patient assistance program for qualified individuals. Patients can download the co-pay card at epipen.com. EpiPen® (epinephrine injection) 0.3 mg and EpiPen Jr® (epinephrine injection) 0.15 mg Auto-Injectors are for the emergency treatment of life-threatening allergic reactions (anaphylaxis) caused by allergens, exercise, or unknown triggers; and for people who are at increased risk for these reactions. EpiPen® and EpiPen Jr® are intended for immediate administration as emergency supportive therapy only. Seek immediate emergency medical help right away. EpiPen® and EpiPen Jr® Auto-Injectors contain a single dose of epinephrine, which you (or your caregiver or others who may be in a position to administer EpiPen® or EpiPen Jr®) inject into the middle of your outer thigh (upper leg) (through clothing, if necessary). Get emergency medical help right away. You may need further medical attention. Only a health care professional should give additional doses of epinephrine if you need more than two injections for a single anaphylactic episode. DO NOT INJECT INTO YOUR VEINS, BUTTOCKS, FINGERS, TOES, HANDS OR FEET. In case of accidental injection, please seek immediate medical treatment. Epinephrine should be used with caution if you have heart disease or are taking certain medicines that can cause heart-related (cardiac) symptoms. Tell your doctor if you have certain medical conditions such as asthma, depression, thyroid disease, Parkinson's disease, diabetes, high blood pressure or heart disease, have any other medical conditions, are pregnant or plan to become pregnant, or are breastfeeding or plan to breastfeed. Be sure to also tell your doctor all the medicines you take, especially medicines for asthma. If you have certain medical conditions, or take certain medicines, your condition may get worse or you may have longer lasting side effects when you use EpiPen® or EpiPen Jr®. *The CO-PAY card can reduce the amount of your out-of-pocket expense up to a maximum of $100 per two-pack of EpiPen® (epinephrine injection) Auto-Injector carton, up to a maximum of 3 two-packs per prescription, until 12/31/15. Valid prescription with Prescriber ID# required. The CO-PAY card can be redeemed only by patients or patient guardians who are 18 years of age or older who are a resident of the United States. Not valid for cash paying patients (except for privately insured patients without coverage for EpiPen® Auto-Injector who make full cash payment) and patients who are covered by any state or federally funded healthcare program, including but not limited to any state pharmaceutical assistance program, Medicare (Part D or otherwise), Medicaid, Medigap, VA or DOD, or TriCare. Void outside the U.S. and its territories or where prohibited by law, taxed, or restricted. The card is not health insurance. Mylan Specialty reserves the right to amend or end this program at any time without notice. Anaphylaxis is a life-threatening allergic reaction that has many possible triggers, occurs quickly, without warning, and must be treated immediately with epinephrine. Symptoms may include hives, itching, swelling or redness of the skin, tightness in the throat, nausea, dizziness, breathing problems, a decrease in blood pressure and/or fainting. Anaphylaxis can be caused by triggers such as food, stinging and biting insects, medicines, latex or even exercise. While symptoms of an allergic reaction vary from person to person, reactions can quickly progress to become life-threatening. EpiPen® (epinephrine injection) and EpiPen Jr® (epinephrine injection) Auto-Injectors are used for the emergency treatment of life-threatening allergic reactions. 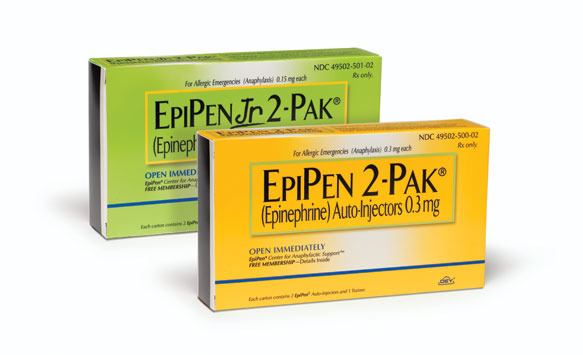 Each EpiPen 2-Pak® and EpiPen Jr 2-Pak® contains two single auto-injectors, instructions for use and a training device, with no drug product or needle, to help patients become familiar with the administration technique. EpiPen® Auto-Injector should be administered immediately at the first sign of an anaphylactic reaction. EpiPen® Auto-Injector is not a substitute for emergency medical treatment. Patients should seek emergency medical attention immediately following administration. EpiPen® Auto-Injector has been the No. 1 prescribed epinephrine auto-injector in the U.S. for more than 25 years and has three-step simple instructions for use. For more information about EpiPen® Auto-Injector, visit epipen.com. Mylan is a global pharmaceutical company committed to setting new standards in healthcare. Working together around the world to provide 7 billion people access to high quality medicine, we innovate to satisfy unmet needs; make reliability and service excellence a habit; do what's right, not what's easy; and impact the future through passionate global leadership. We offer a growing portfolio of around 1,400 generic pharmaceuticals and several brand medications. In addition, we offer a wide range of antiretroviral therapies, upon which nearly 50% of HIV/AIDS patients in developing countries depend. We also operate one of the largest active pharmaceutical ingredient manufacturers and currently market products in about 145 countries and territories. Learn more at mylan.com. This press release includes statements that constitute "forward-looking statements," including with regard to Mylan's statement that it has sufficient supply to meet any anticipated demand resulting from the voluntary nationwide recall of all Auvi-Q® product currently on the market; Mylan's work to provide a seamless transition for patients and their caregivers who may now be prescribed EpiPen® Auto-Injector; and Mylan's optimism that the widespread familiarity with EpiPen® Auto-Injector established over more than 25 years, coupled with its robust training resources, will provide access and support for those impacted by the Auvi-Q® recall. These statements are made pursuant to the safe harbor provisions of the Private Securities Litigation Reform Act of 1995. Because such statements inherently involve risks and uncertainties, actual future results may differ materially from those expressed or implied by such forward-looking statements. Factors that could cause or contribute to such differences include, but are not limited to: any changes in or difficulties with our inventory of, and our ability to manufacture and distribute, the EpiPen® Auto-Injector; the effect of any changes in our customer and supplier relationships and customer purchasing patterns; other changes in third-party relationships; the impact of competition; changes in the economic and financial conditions of the businesses of Mylan; the scope, timing, and outcome of any ongoing legal proceedings and the impact of any such proceedings on our business; any regulatory, legal, or other impediments to our ability to bring our products to market; actions and decisions of healthcare and pharmaceutical regulators, and changes in healthcare and pharmaceutical laws and regulations, in the United States and abroad; our ability to protect our intellectual property and preserve intellectual property rights; other uncertainties and matters beyond the control of management; and the other risks detailed in the company's filings with the Securities and Exchange Commission. The company undertakes no obligation to update these statements for revisions or changes after the date of this release. EpiPen®, EpiPen Jr® , EpiPen 2-Pak®, EpiPen Jr 2-Pak® and My EpiPlan® are registered trademarks owned by the Mylan companies. All other trademarks are property of their respective owners. © 2015 Mylan Specialty L.P. All rights reserved.